Darryl Daniels young life thus far not only exemplifies excellence, but should be looked at as an example of the possibilities that are within our reach. His level of commitment to his community and determination for personal growth is unmatched. Darryl Daniels is already making headlines and is indeed a rising leader. Daniels is a Detroit native and Cass Tech High School alum class of 2007. After high school Daniels graduated from Michigan State University with a degree in Political Science and a minor in Economics. Daniels also had the pleasure of being an intern at Detroit PAL in 2011. With his assistance, PAL launched the Golf program. “It was great! I got to be apart of ushering in a new program at PAL. That was pretty cool” Daniels exclaimed. From there his passion for helping others only continued to grow. With an immense interest in the family, criminal law and Justice Daniels furthered his education and entered Law School. 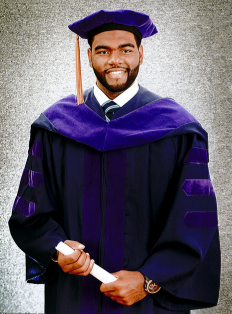 As a member of Howard University’s Law School, Darryl takes great pride in this opportunity. He is also a member of the Howard Child Welfare Clinic, where he is a student attorney and is able to try cases. In particular he works with fathers who wish to gain custody of their children. He described his most recent case where he represented a father and successfully assisted his client in gaining full custody of his daughter. “The parents were arguing and the police were called. It was determined that the mother was abusing PCP. Rather than give the father custody, his aunt received guardianship. But as her father, he rightfully wanted custody. I was first chair in representing him and after a three day trial it was determined that the police did not follow protocol. The father was given full custody of his child!”Daniels sees winning this case and others like it as his way of giving back to the community. Detroit PAL commends Darryl Daniels efforts in the community and being such and outstanding leader.